I’m afraid that today’s post truly lives up to the “eclecticism” part of this blog name. Searching around for some inspiration for commentary to go with photo, I learned some rather interesting new bubble gum trivia. I hope you don’t my sharing it with you here. …that the energy Americans expend everyday chewing bubble gum could light a city of 10 million people for a day? …that bubble gum was included in ration kits of soldiers serving in WWII? 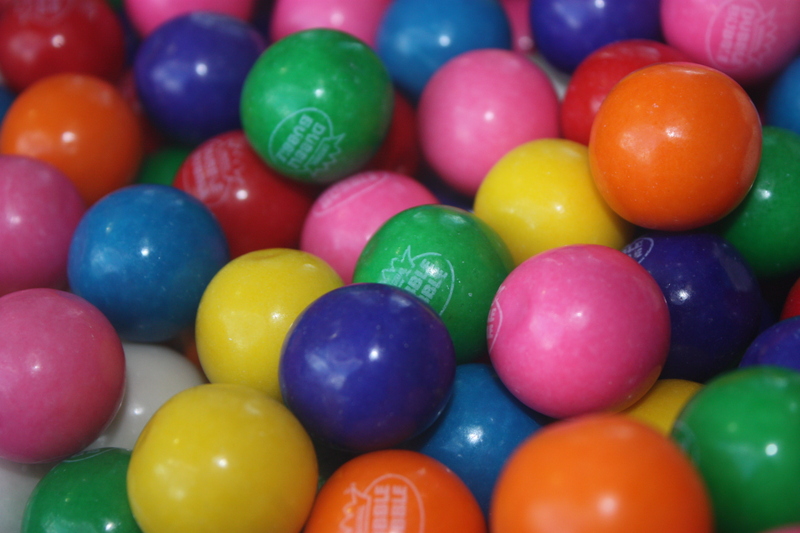 Your thoughts on bubble gum brought back memories of my Dad. He wouldn’t let me chew it (that is if he knew it) when i was a little girl, said it might “pull out my teeth”. And do you chew gum now?� I don’t very often.� I should chew minty gum�more, as they say this keeps your appetite at bay. �� Thanks for stopping by my blog and for leaving comments…I love comments! Neat facts about gum. Nice colors too.